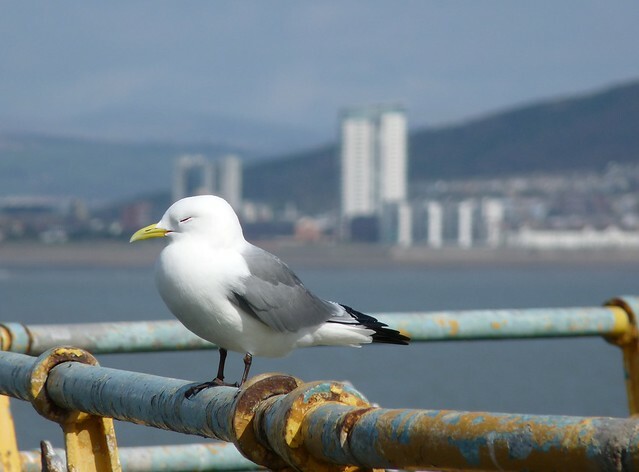 I made a passing comment a couple of posts ago that the Kittiwakes would soon be back on Mumbles Pier and Jeremy kindly let me know that they already are! The breeding colony on the pier is now well over twenty years old and is one of only a couple in the UK that is on a man-made structure. Of those this is the only one that is so easily accessible. For a mere fifty pence you get unlimited time with these charismatic birds at little more than arms length. The only challenge is trying not to repeat the same photos over and over and to avoid any flying hooks from the assembled fishermen (something with which I have seen the birds struggle in the past). It was low tide during my visit and warm which probably accounted for the rather sleepy nature of the vast majority of the birds. Here are a selection of my favourite shots from Saturday. Last year I made several trips to the pier to try and document as much of the breeding cycle as possible. I missed the initial nest building stage but witnessed everything from eggs to fledging. The reason for this concerted effort was that the pier owners are currently trying to get planning permission for a complete redevelopment of the area (something which I support in general), including an almost wholesale replacement of the pier structure. 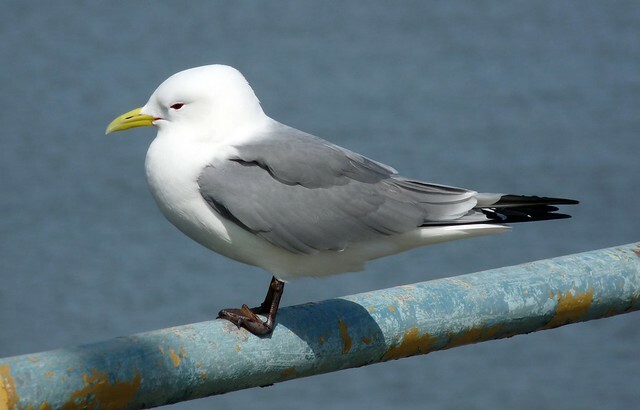 I have looked through the documents that I can find on the internet and there is mention of a bird survey giving specific attention to the Kittiwakes as part of the proposal, but details on any work to minimise the impact on them is scant to say the least. 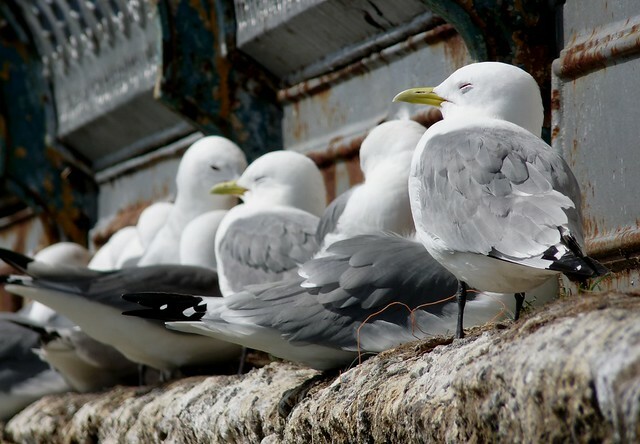 I am not sure where the law lies with relation to disrupting a Kittiwake colony but I really hope that that the birds manage to tolerate the work and will be here for another twenty years at least. The Mumbles would be a lesser place without them and their distinctive voices. That is a lovely colony to have on your doorstep Adam. 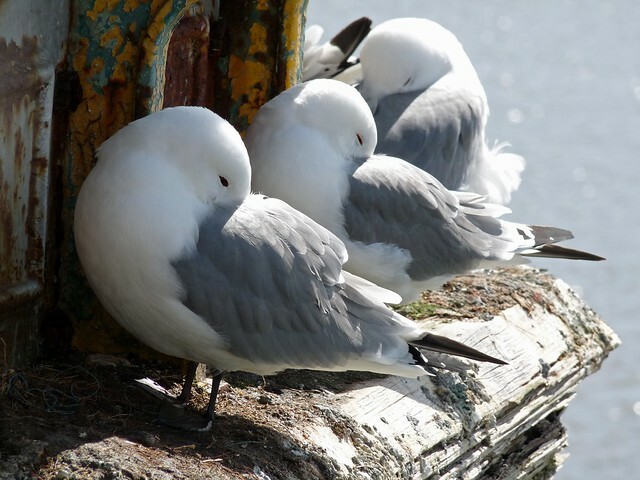 Does your County Bird Club provide environmental feedback on projects such as the pier redevelopment? 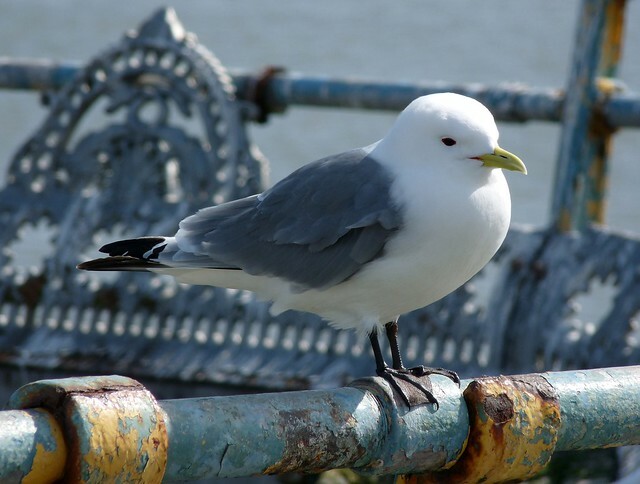 The Kittiwakes are beautiful, especially the way that you photograph them. Extremely good. Nice shots, Adam. Do you have any links to online info about the pier development? I'm sure the Kittiwakes could be used to lure in bird-loving toursits! It certainly is Frank. 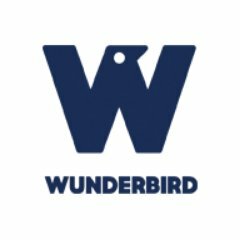 We have two bird clubs that cover Mumbles and I would hope they would be pushing to have their voices heard even if they are not asked. Hi Jeremy. 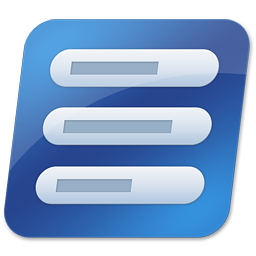 The information I have was found at http://mumblespierdevelopment.com/Documents/MumblesPierDevFramework_April09.pdf. I haven't been able to find anything more up to date since. And I completely agree about them being used as an attraction. Welcome Beatriz. The colours are fabulous but the corrosion is one of the things putting these birds at risk. Great images Adam of a beautiful bird. South Stack on Anglesey is where I get to view them. Nice to view see your local colony. We have a similar dilema up here with the colony in central Newcastle. There is currently a movement to get the Kittiwakes off the Tyne Bridge using tourism disruption as a reason. The birds were moved from their original colony when the Baltic Arts Centre was converted from the original mill and a temporary nest tower was quite successful. If the site is right they are pesistent and even nest on top of the anti bird spikes on the Tyne Bridge! Great close ups Adam!! Boom & Gary of the Vermilon River, Canada. Great photos. It would be a pity if the development disturbs the colony. That fourth shot is awesome! I just know looking at these that sun was warm and inviting and closing their eyes and basking in its warmth was the perfect thing for them to do. After 20 years it would be sad if they didn't have a place to go. Hope the efforts are successful for them. Great photos hope the birds get to stay there. Wonderful photos, they are beautiful and you captured them well. Brilliant shots and an engaging story. I love the extra texture and perspective of the pier structure in with the gulls. The second photos depth of focus and composition is a prize winner! Great pictures and post. it is always fun to read about birds from other lands. In the 1960's I visited Wales and it was a beautiful place. Enjoy. Adam, your photos are wonderful! 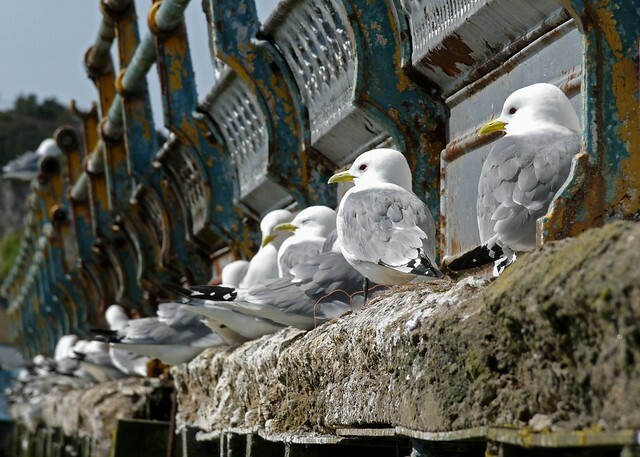 Excellent read concerning the Kittiwakes. Beautiful shots, Adam! That place looks magical and it would be a pity if it got disrupted by the renovation. 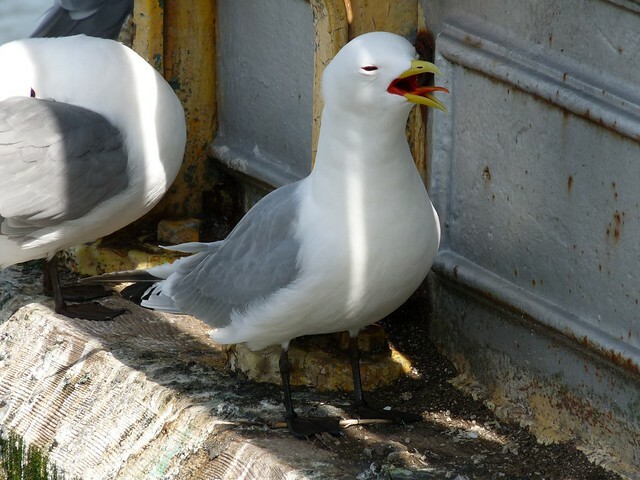 I got some pictures of Kittiwakes when visitng Helgoland a couple of years ago, but yours are so much better. Wonderful shots of these lovely birds -- I especially like the frame where the three of them have their beaks tucked away! Andrew - I'm heading up to Anglesey this Easter so will be popping into South Stack for the first time. 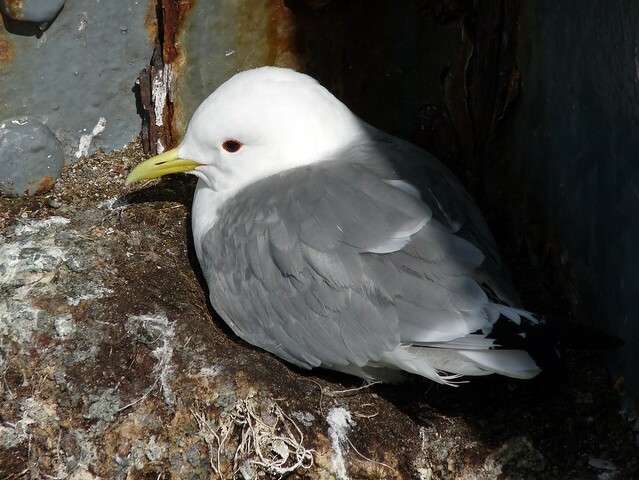 PCF - It's good to hear that there is evidence that Kittiwake colonies can survive this sort of disruption. I have been in contact with the pier owners and it seems that a lot of work is going on to ensure that the birds can and will return. Texwisgirl - I know what you mean. I have a feeling you'd get a nasty nip if you did try to stroke them though. Gary, Joo, Neil, Sondra, eileeninmd, Springman, Bill, bailey-road - Thanks. Glad you liked the pictures. Hilke - If planning permission goes ahead then disruption is inevitable I'm afraid. What I want to ensure is that the disruption is minimised and that there is adequate opportunities for the birds to return once the work has been completed. Pat - Glad you liked them. That's my favourite as well.